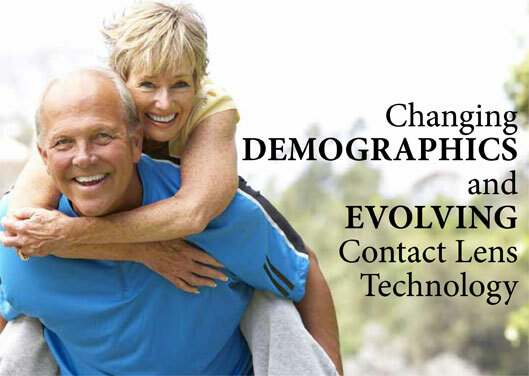 Demographically speaking, we are living in an unprecedented time in history. Never before has North America been home to so many baby boomers, individuals aged between 48 and 66. The effects of the aging population on our overall health, and on ocular health in particular, must be viewed in terms of vision correction. According to Statistics Canada,Canada’s boomer population will increase dramatically over the next three decades. By 2020, those aged 65 and older will comprise 18 per cent of the population. Most startling is the fact that between 2005 and 2036, seniors’ representation in the population is expected to almost double, to a staggering 24.5 per cent. The “greying of Canada” means that golden-agers will make up a significant and growing portion of optometric practices, a fact that has implications for contact lens use in particular. Today’s baby boomers are active and vibrant, and enjoy participating in a variety of sports, as well as cultural and work-related activities. Happily, this coincides with practitioners’ growing armamentarium of contact lenses designed to suit all of these needs. Given the preponderance of individuals over 40, presbyopia – which affects near and intermediate (arm’s-length) vision – is a growing concern. By the age of 50, multifocal lenses may enable a person to see clearly across a room and up close, but vision at arm’s length may be moderately blurred. In the past, multifocal lenses provided less-than-satisfactory results, often producing glare and discomfort. While some optometrists turned to monovision as an alternative, this resulted in compromised quality of vision and depth perception. The good news is that contact lens designs and materials have since evolved to better meet consumers’ changing needs. Recent developments in contact lenses now permit better visual quality at all distances for many individuals and minimally compromised vision for the rest. Numerous multifocal lens designs are available to patients, depending on their age and visual requirements. Multifocal lenses for specific activities like computer work, as well as various sports, are examples of the specificity of the current contact lens market. With the advent of multifocal contact lenses, baby boomers can enjoy the convenience and aesthetic advantages of contact lenses as a replacement for eyeglasses. Soft, disposable multifocal designs, for example, have simplified the fitting process, while providing better visual quality than earlier renditions. Each multifocal lens design has a different lens geometry, with unique positive and negative features that must be taken into account. Manufacturers’ fitting guides for each design provide helpful guidance in understanding these features and the ways in which various designs differ from one another. Aspheric multifocal contact lens designs, in which both distance and near prescriptions are placed centrally, mimic the effect of progressive eyeglass lenses. The various prescriptive powers are blended across the lens in a smooth transition. While some practitioners find that fitting multifocal lenses is time-consuming, the benefits of having a satisfied patient return make the effort worthwhile. It is also true that more complex lenses require more time on the part of the practitioner and that fees will reflect this. The discomfort caused by dryness is one of the common symptoms that causes contact lens dropout across virtually all age groups. Dryness is caused by a multitude of factors, not all of which are purely ocular. According to the National Eye Institute’s Visual Function Questionnaire: Impact of Dry Eye on Everyday Life (IDEEL), approximately 34 per cent of contact lens wearers discontinue use at least once, primarily because of dry eye symptoms. In light of this, eyecare practitioners should be mindful of patient groups that are particularly susceptible to dry eye and adjust their contact lens materials and design accordingly. Further, careful selection of disinfection care systems is also required for those individuals. This includes post-menopausal women suffering symptoms of dryness with contact lens wear, women who experience hormonal changes associated with menopause, as well as those who take estrogen supplements without progestin. Other major contributing factors that need to be considered in contact lens and lens care product prescribing are LASIK surgery, which has become increasingly popular among baby boomers, and diabetes, which has reached epic proportions. Communicating with patients in order to fully understand their lifestyle and vision needs, particularly in terms of near and intermediate distances (including the patient’s priorities for distance vision), will help determine visual needs and contact lens choice. It’s one thing to have advanced contact lens technology at one’s disposal; communicating its availability is another. While optometrists are fortunate to be able to carry a more expansive contact lens inventory than ever before, explaining the therapeutic pros and cons of each design is essential and will build the patient’s confidence in the practitioner as he/she leads the patient into the most ideal modality of vision correction.